Almost each of us has a different method for planting seeds. I am still using the same method since I started breeding Brugmansia. 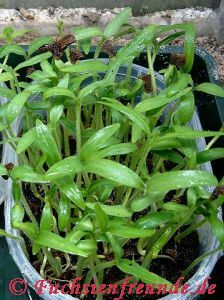 The sterilization of the soil before planting the seeds is a must in order to kill fungi, bacteria and/or soil pests like fungus gnats, which will eventually harm the seeds and later the seedlings. For me, the hot water sterilization works best. 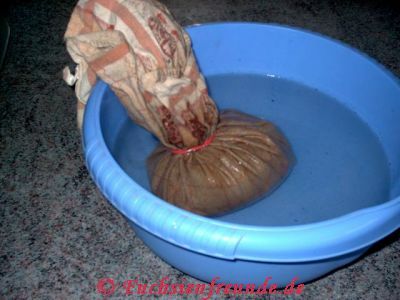 For that purpose, the soil is wrapped in a old cotton kitchen towel and placed in a bowl. Afterwards the bowl is filled with boiling hot water. I leave the soil in it until the water has cooled off so I can press the water out of the soil with my hands. 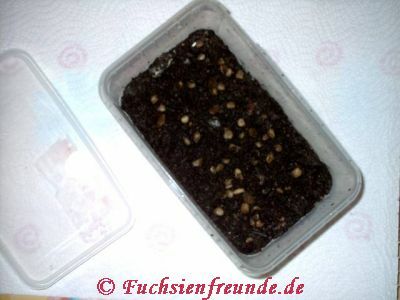 After cleaning the seedbox throroughly, the sterilizied soil can be placed in the seed box. Before planting the seeds, they must be cleaned thoroughly to remove possible attached organic material. Attached organic material is nourishment for fungi spores and bacteria. After planting, the seed box has to be covered and closed, to keep the seeds moist and to keep fungi spores and gnats outside. I recommend a 15 Watt heating pad to provide bottom heat for a faster and higher germination rate. In approximately 10 - 21 days, the first seeds will germinate. 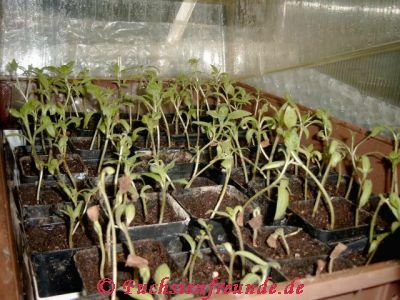 The germination may take up to four weeks, until all fertile seeds have germinated. Does the humidity prevent the cotyledons becoming trapped in the seed coat? 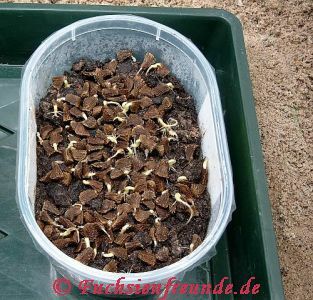 Alistair hat geschrieben: Does the humidity prevent the cotyledons becoming trapped in the seed coat? 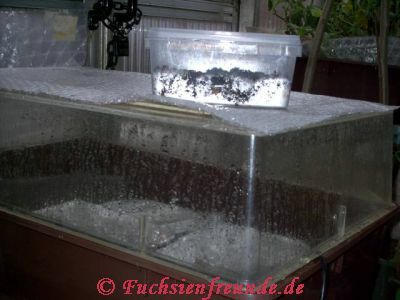 The humidity is the best preventation for it and it also encourages a good germination. 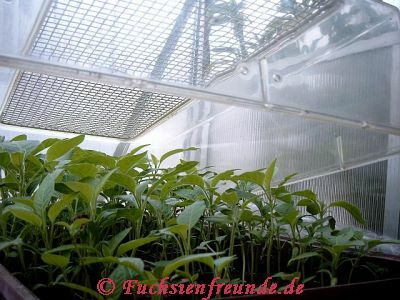 After transplanting, the seedlings still need high humidity. The root system is still weak and only poorly developed. I provide the needed humidity by covering the propagation bed with a hood. several weeks later. At this stadium, they will slowly hardened off by slightly lifting the hood. 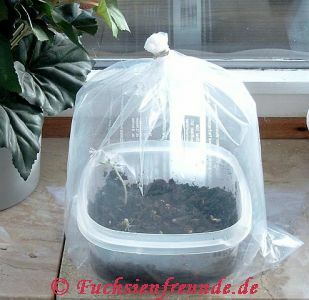 I use a microwave oven to sterilize my compost and use the heat mat Ihave this with artificial lighting so I can grow seeds over winter. What kind of seeds are we talking about???? Gina hat geschrieben: What kind of seeds are we talking about???? Gina, these are Brugmansia seeds. Good Lord Monica, there are so many of them yeeez, how on earth do you do it. You must have some greenhouse to house that lot. I have never seen that many plants.Amazing. What do you do with all that lot???? Gina hat geschrieben: Good Lord Monica, there are so many of them yeeez, how on earth do you do it. You must have some greenhouse to house that lot. 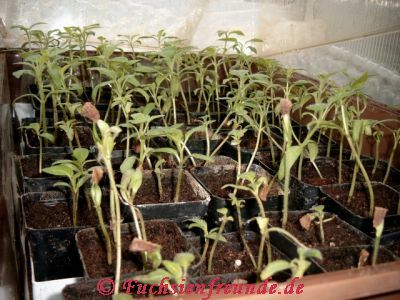 I raise all seedlings until they are flowering. Then I select the best out of them to evaluate these for one more year to select the best again. All of my crosses are well planned. The knowledge about the heritage and inheritance of both parents is very important to be successful. To find out, if the crosses were successful, you have to plant all seeds of one pod and also raise all seedlings. Gina all the seeds in one pod cross have the potential to be different it takes a dedicated grower to grow all the seedlings to find the best this is why Monika is the best. I have had two seeds out of one pod and they have been completely different colours,one pod had some seeds with flowers that had different numbers of points.Some pass the seeds on to other growing enthusiasts who grow them on and report back on the results of any good ones this is probably the easiest way of growing for us amateurs. Well I am amazed, by you all, all your dedication, I have so much to learn it is unbelievable. I was just glad that some of my brugs survived the winter, that was an achievement in itself to me.lol.